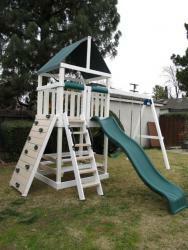 We are happy to assist you in designing the perfect swing set or play system for your family's needs and environment. If you need to accommodate and work in harmony with existing trees, uneven terrain or limited space, we can help. Please email us or call us at (818) 464-3461. The Tiger Towers Polyvinyl Deluxe Play Set features a classic design for a budget price. 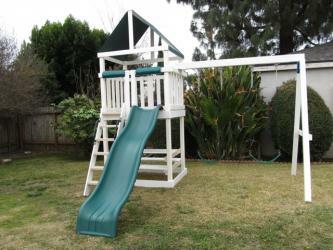 It includes dual swings, a slide and side ladder. It also includes the Picnic Table and Rock Wall. 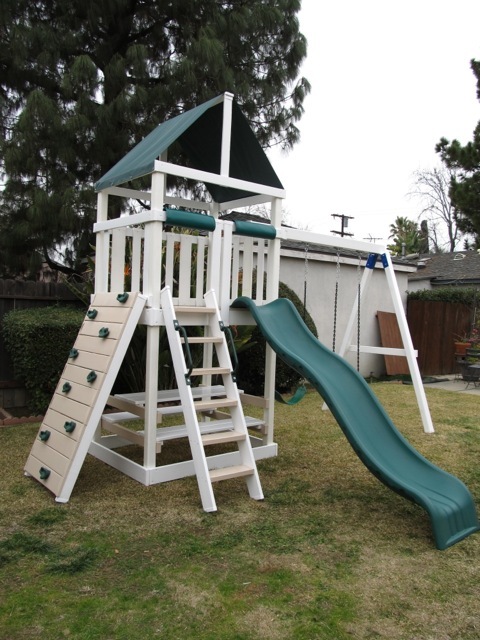 The Tiger Tower Basic Play Set features a classic design for a budget price. 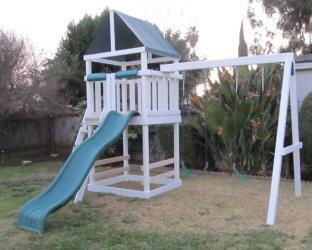 It includes dual swings, slide and ladder. The Tiger Tower Polyvinyl Play Set features a classic design for a budget price. It includes dual swings, a slide, and ladder. This model also includes a Picnic Table.